In this Volume we collect the stories of the The Lost Boys of West Abbey. I was somewhat surprised in the length of this collection as compared to the first two volumes. It felt incredibly punctuated and short. The adventure and intrigue were over in the blink of an eye and had little meat to the story. 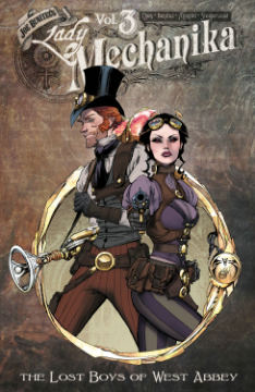 Though it had the typical stereotypes of Holmesian crime and steampunk, it utterly lacked the flair I had noticed in the first two volumes to poke fun at its obvious use of those stereotypes. There just wasn't room in this overly condensed story for any of the banter and mystery. Right from the start you know exactly where this story is going and you almost want to give up from there, but then I realized it was so short I might as well carry out to the end. I really saw the potential in the story line but was mostly left with a shake of my head at the cliche. This doesn't make me lose hope on the whole franchise, but it certainly put a damper on this experience. I'll try again with La Dama de la Muerta this fall. But fear not, Metal May will continue tomorrow with a different steampunk story. My reading appetite is back!